Here Chabrier the opera composer succumbs, like many of his contemporaries, to the temptation to write a scène for voice and piano. The setting of the same poem by Bizet in his Feuilles d’album (1866) is not one of that composer’s most performed songs. The reason for that is its sheer difficulty – Bizet uses thundering triplets for an accompaniment which simulates a horse-ride in a manner reminiscent of Schubert’s Goethe setting, Willkommen und Abschied. The stamina required for Bizet’s music is almost comical, and at least Chabrier, by comparison, spares the horses. It is true that he also uses breathless triplets to propel the music forward, but he cuts two of Musset’s lengthy strophes and on this occasion has a better feeling for the piano as an accompanying instrument than the composer of Carmen. Like Bizet, however, Chabrier had a fondness for the effulgence of meaty voices at full pelt. This sometimes leads him into making outrageous demands in terms of tessitura. Here he makes the mistake of writing a song that is very low for a tenor and too high for most baritones. As in L’Enfant, the piano’s introduction (a veritable overture of twenty bars) is centred on a left-hand melody – the tessitura suggests a bank of cellos – and such is the composer’s enthusiasm we can even forgive the somewhat predictable nature of the falling sequences which are meant to put a distance between Suzon and the narrator – as if her figure was shrinking in his vision with each successive harmonic twist. As in Lied, the piano establishes a pattern over which the vocal line soars like a low-flying bird, sometimes executing graceful coloratura pirouettes in mid-flight. The effect of this is aimed at providing a pleasing and exciting musical effect – a symphonic totality; any detailed response to words is impossible within this kind of all-embracing musical impetus. The strophic structure also makes some of the later melismas seem pointless and inapposite. 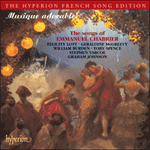 It is true that the harmonic changes under the held high G on ‘bien loin’ suggest the object of affection slipping from the lover’s grasp, but touches such as these are rare in an aria which is one-dimensional. On the other hand the final effect of this song is true to the text: despite the hectic heroics of these ‘bien loin’ phrases (which suggest the high-lying sobs of operatic heartbreak) the overall mood is one of renunciation and gentle melancholy. The postlude dies away in a manner which avoids typical finale tub-thumping and this shows that young Chabrier is sensitive to the scenario. Needless to say the song is never at a loss for melody; the awkward jumps in the vocal line, though extremely difficult, seem truly expressive; and once again the composer revels in challenging his singer to the iron-lung test: tied notes at the end of phrases which seem to last forever. Je m’en vais pourtant, ma petite.